I had a plan for Christmas this year. I spent time on Pinterest, putting everything together in the early weeks of November. 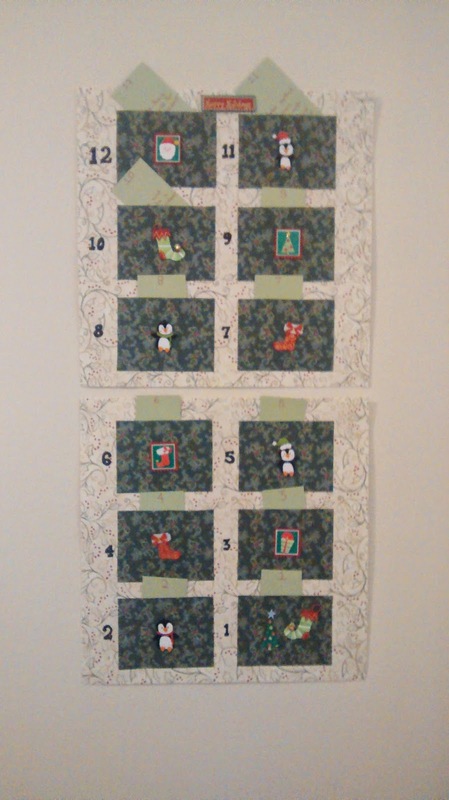 I had all of the projects and activities planned out for the daily Advent activity calendar, a tradition which I started last year with every intention of using it yearly. There was going to be the night to drive around Rochester to look at Christmas lights and sip cocoa, the trip to the mall to see Santa (we know he is pretend in our house, but we like to play the game), the Polar Express movie night, the yearly tradition of making and delivering cookies to the neighbors. There would be the making of nativity props and the retelling of the Christmas story together, the hours spent reading Christmas books and lighting candles, and the playing of Christmas music and singing and dancing along together. It was going to be good. I was so excited! Reality hit fast. Thanksgiving Eve brought an unexpected evening in the hospital with Baby S, and things just didn't stop from there. In four weeks, we had eight doctor appointments for Baby, plus the normal court date, visits with birth parent most weekdays, a case worker home visit, and a WIC appointment. Some days brought two or three appointments. I had to find someone to watch Big Bro during appointments, especially the ones that left Baby S crying in pain or hunger from needles or fasting, or the ones that took hours to complete. This often meant Josh being home during part of his workday and then working evenings, days off and early mornings to make up for the missed time. Instead of building cherished family memories as we approached Christmas, it sometimes felt like we were never all in the same place at the same time. And so... My Christmas Advent calendar. The three papers sticking up at the top of the calendar are the ones I actually read to Big Bro. Out of those three, we only actually did one of the projects. 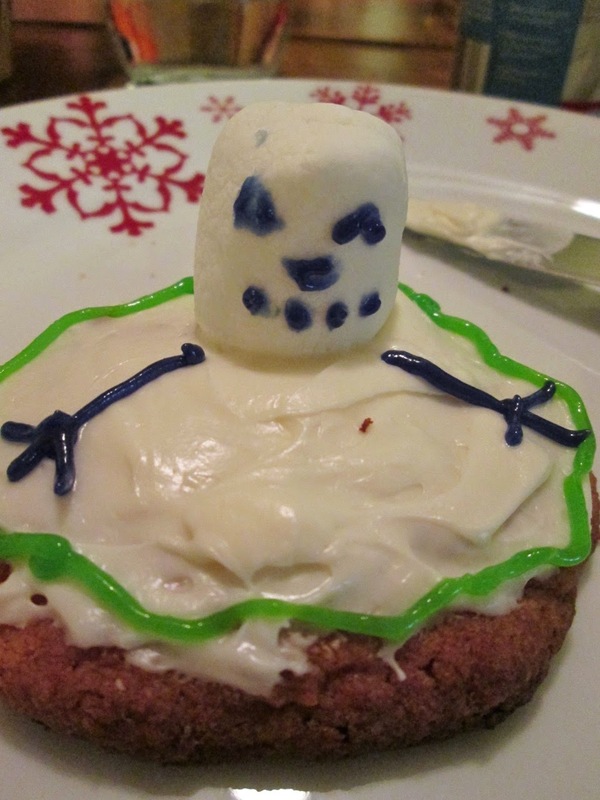 Big Bro was super excited to make "melted snowman" cookies with some friends. 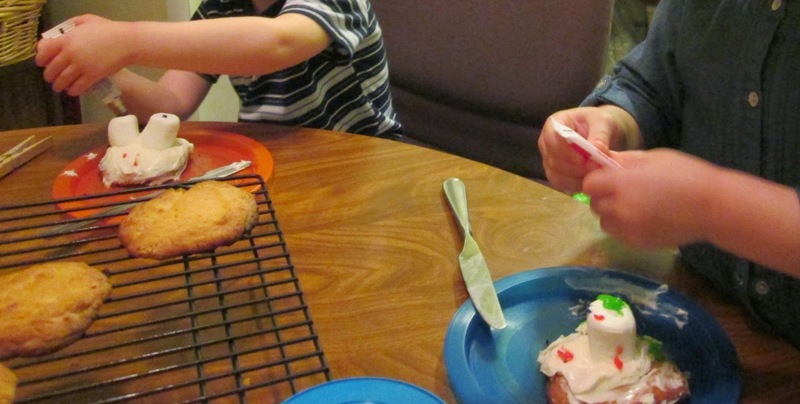 My idea of a melted snowman cookie versus Big Bro's idea of a melted snowman cookie! One activity... One event... Out of 24. Hours of planning, trips to the store, and all my imagined treasured family moments... Well, they didn't pan out. And in a "last straw" kind of a moment, when it turned out that one of the main events we were planning on attending had sold out of tickets and that we did not, in fact, have any tickets yet, I absolutely did break down and cry. Did we miss Christmas this year? Big Bro didn't care. 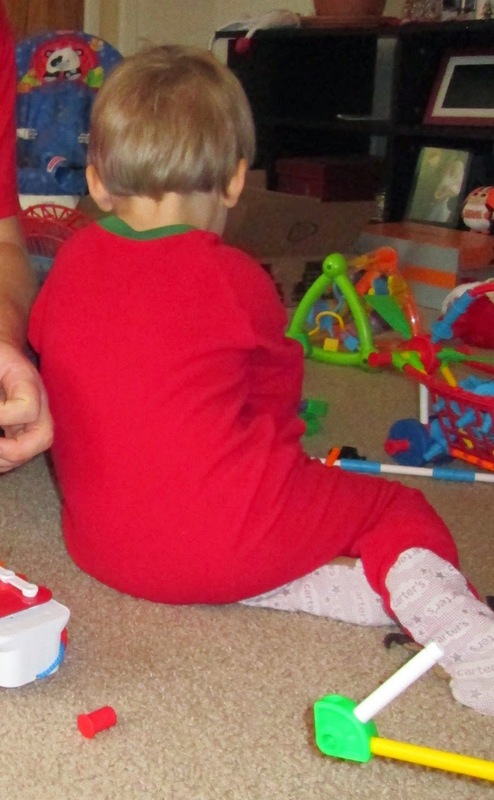 He loved Christmas, even when one thing after another did not happen or happened differently than planned. When we piled up snug and cozy in our pjs under a mountain of blankets and turned on the tv to watch a Christmas movie, only to find out that ABC is definitely not the same as ABC Family (my fault)... He was totally content to watch anything else, as long as we watched together. 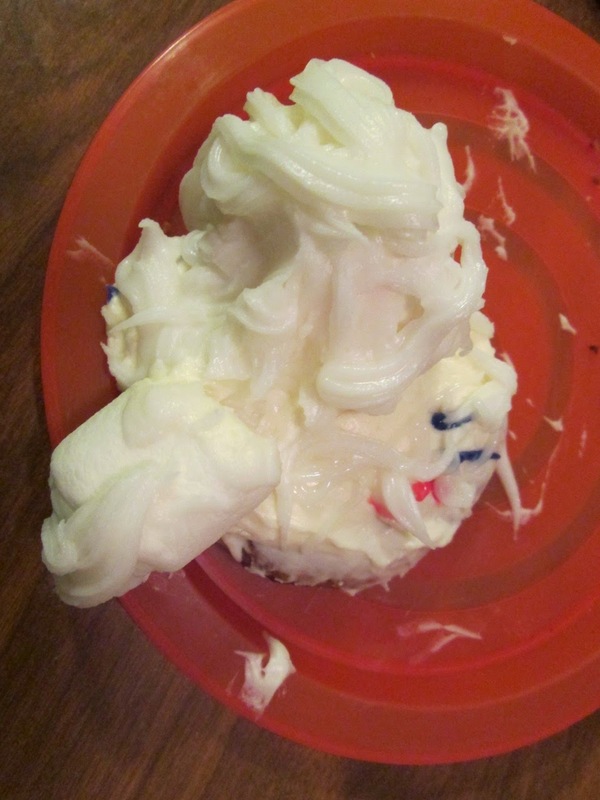 When Christmas Eve rolled around and our oven was still broken and not able to make Christmas cookies... He was content helping me dip pretzels in melted chocolate. (Even my dumbed-down box-mix Christmas cookies were too much for us this year, guys; they're still in my pantry, untouched.) He didn't care that we didn't get to the big Christmas festival; he just wanted to play trains with Mommy AND Daddy both home at the same time. He didn't feel cheated of Christmas music or special Christmas treats. He had a great Christmas. The only plan that worked as planned was the one that was not mine. Isn't that frustrating, sometimes, when you've tried so hard? But ultimately, the only important part of the Advent season still happened. Daddy and Big Bro read a Bible story each night, checked it off in their countdown to Christmas, and lit candles to remind us that Jesus' birth means the coming of hope and light for the world - for us. Without all of the other fluffy stuff, this nightly ritual stuck out more, and became so much more special. Guys, I still want to do my fun little activity Advent calendar next year. I'm going to try. I love those cheesy sweet things that we do as a family leading up to Christmas, and I am still a little sad that we missed them this year. But... I don't have that feeling of regret anymore. Christmas happened. It was good. We had our focus on God this year above all else, and I cannot feel dissatisfied about the rest when that one most important thing was right. I won't feel guilty for the missed experiences. Ultimately, nothing could have made him happier on Christmas day than spending hours playing with his new Tinker Toys! Because in all of this, we learned that we put each others' needs before our own wants. We learned that we can work with birth parent in stressful circumstances, tight quarters, and long amounts of time, and still get along for Baby's best. We learned that we have so much support from an amazing medical team at Strong (I cannot overemphasize how awesome they are there). And, thank God, we learned that our Baby does not need surgery. On Christmas Eve, I got the call from the doctor that the results from the previous week's five-hour-long test had come back and that the suspected problem was not there. No need to remove anything from that tiny little baby! What an awesome Christmas gift. The long Advent season of waiting and wondering, of feeling so little control over our circumstances and constantly surrendering our fears and worries over to God, was over in time for Christmas. How peaceful and content we were to finally have closure on this long series of tests. How appropriate to feel that peace and fullness as we headed to Northridge to celebrate Christmas together with our church family. We still don't have real, definite answers. This season of restfulness and peace, as far as it depends on Baby's health, may not last. But the taste of hope and fullness was real. And it was a beautiful reminder that ultimately, Christmas is not just a birthday, but the celebration of the end of waiting - the end of fear. I now have a better glimpse into what Advent really means. Oh, the waiting can be so hard. The longing for hope and wholeness can be so strong that you feel it. Things are so out of our control. I want Heaven more now than I did before. I don't have control over whether Baby stays or goes; every beautiful family moment at Christmastime has that little taste of bittersweet that I try not to acknowledge. I've been reminded that even having him here, in our own home, does not ultimately guarantee me control over his safety or wellness. All I can do is love God and serve him fully, trusting that he will work everything together for his good and mine. Thank you, Jesus, for ending the wait. Hope is here. And in my busiest of Christmases, I am able to feel my need for that hope more than ever.